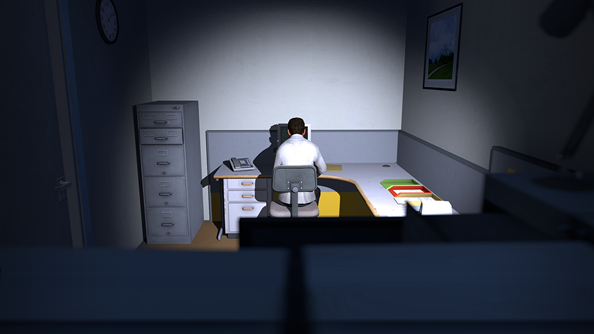 The Stanley Parable is the story of an office drone who looks up from his desk to find his workplace deserted. It began life as a Source mod, and grew last year into a standalone work of quiet genius. The game introduced a wonderful twist to PC gaming’s traditional malevolent AI routine. Its narrator, the English actor Kevan Brighting, begins Stanley’s story in the time-honoured mode of BBC audiobooks – but becomes rueful, flabbergasted and downright grumpy as the player begins to contradict the tale he’s telling. Sound like fun? A million other PC gamers thought so. “One million copies! !,” added Wreden’s British counterpart, William Pugh. The Narrator, Brighting, recorded his own thoughts on the momentous milestone in-character. The Stanley Parable was released a year ago last Friday, and earned its own Dota 2 Announcer Pack in May. I last played it yesterday, as a matter of fact. It’s still deliciously reactive and terribly funny. How did you find it?